Today we receive ashes on our foreheads to help us remember that we are dust—people living on borrowed time. We grumble when our stuff or our skin starts to crumble. We cry when we sit at the funeral of loved ones or stand at the grave looking at the box holding their remains. Seeing that casket forces us to be more aware of the Ash Wednesday formula: “Remember you are dust, and to dust you shall return” (Genesis 3:19). This day, Ash Wednesday, we can choose to come forward publicly to have ashes rubbed onto our forehead and into our consciousness. It’s a way of telling ourselves: “We only have so much shelf life.” Then we crumble back into the ground from which we came—with the resurrection, with Christ, as the hope that remains. Tough stuff. 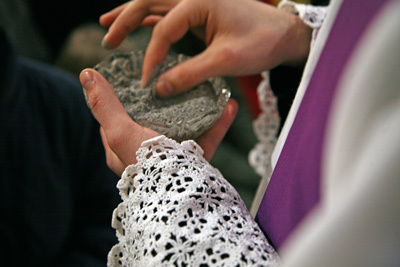 On Ash Wednesday, we enter into Lent and are reminded that we live on borrowed time. Then, with a sense of humor, the Ash Wednesday Gospel has Jesus telling us to go stealth: “Wash your face. Go into your inner room and start your praying there. Then, living on borrowed time, go out and give to the poor.” Give up. Fast. Rise.